Vascular calcification is a form of ectopic mineralization which arises from the deposition of calcium (Ca) and phosphate (P) in major arteries and cardiac valves. This degenerative disease was described for the first time in 1903 by a German pathologist, Johann Georg Mönckeberg, who noticed a form of sclerosis affecting the middle coat of arteries (Mönckeberg’s sclerosis). The incidence of vascular calcification is positively correlated with high mortality and morbidity rate for cardiovascular diseases; this is due to the formation of hydroxyapatite crystals in distinct layers of blood vessels that is responsible for increased stiffness and decreased compliance of arterial walls. Of course ectopic calcification also influences the general cardiac efficiency, leading to deterioration of coronary perfusion and episodes of sub-endocardial ischemia. It is not uncommon to observe ventricular hypertrophy and increased pulse pressure in patients who are affected by this pathological process. This is why vascular calcification is considered an accurate predictor of adverse cardiovascular events, including myocardial infarction and stroke. According to the layer that is affected by mineral deposition, several kinds of vascular calcification can be identified. Intimal calcification takes place in the inner layer of the major blood vessels and is typical of atherosclerosis: small aggregates of crystalline calcium can be detected in the developing lesions of the endothelium that are induced by inflammation and lipid deposition. In this case the degree of calcification is correlated with age and level of hypertension. Calcification also influences cardiac valves that are affected by inflammation and mechanical stress; this is a life-threatening condition because of the obstruction of the outflow due to the thickening of the leaflets. In fact calcific aortic valve stenosis is the major cause of valve replacement in Europe and North America. The picture below shows an extensive calcific aortic valve stenosis in the valve leaflets of a patient undergoing valve replacement surgery. 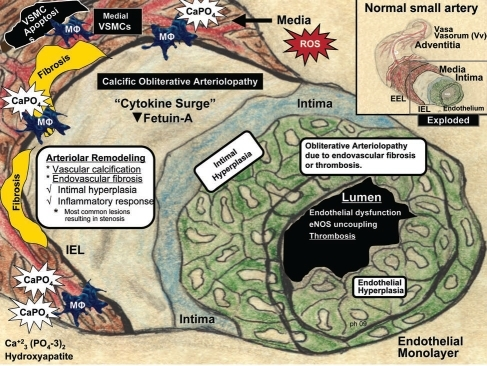 Nevertheless the most severe form of calcific vasculopathy is medial calcification which occurs in the tunica media, the layer that supplies mechanical strength and contractile power. Although it can be noticed even in diabetic patients, its most detrimental manifestations are observed in chronic kidney diseases (CKD). Patients who are affected by an end-stage renal disease (ESRD) show a severe widespread form of medial calcification that is called calcific uremic arteriolopathy. It is a necrotizing condition triggered by the exposure to an increased oxidative stress and a condition of inflammation that are characteristic of the uremic milieu and negatively affect endothelial function. Calcific uremic arteriolopathy influences cutaneous and subcutaneous arteries and arterioles, leading to intimal proliferation, fibrosis and thrombosis, with high mortality rates. A positive association between the presence of vascular calcification and renal failure has been reported in several studies. Furthermore clinical and epidemiological evidence shows that the process is particularly severe in patients who undergo dialysis and cannot be easily reversed through successful transplantation of kidneys (Mechanisms and clinical consequences of vascular calcification, 2012). The following paragraphs analyze the main factors which contribute to the development of this life-threating disease: dysregulation of mineral balance and oxidative stress. In the past years vascular calcification was thought to be an entirely passive process and this meant that any therapeutic strategy would not have been able to reverse or, at least, slow it down. Recent study have pointed out that ectopic calcification instead is a highly regulated cell-mediated process which shares many similarities with the physiological mineralization in the bone. In fact extra-skeletal calcification arises from the nucleation of hydroxyapatite crystals performed by membrane-bound matrix vesicles. This process is usually avoided by the action of several inhibitors on inductive mechanisms; under pathological conditions instead the balance described in the picture below is completely upset and ectopic calcification takes place. Moreover susceptibility to this form of vasculopathy appears to be genetically determined. It has been observed that patients who develop calcification during dialysis exhibit a particular pattern of gene expression that is associated to higher coronary Ca score and higher pulse pressure if compared to the one of those patients who instead do not develop calcification during the same therapy. This evidence may be explained by the fact that the first kind of genotype is responsible for the decreased activity of the ectonucleotide pyrophosphorylase 1, the enzyme that generates pyrophosphate (PPi), an important inhibitor of the process of mineralization. Its deficiency determines the generalized infantile arterial calcification, a genetic disease that leads afflicted neonates to premature death due to episodes of fibrosis and stenosis. The weird aspect of this disease is that it takes origin from vascular smooth muscle cells (VSMCs) which undergo a bone-like trans-differentiation. VCMSs that can be found in the tunica media of blood vessels usually show a contractile phenotype and exhibit high level of expression of genes which are needed for the maintenance of the structure of myofilaments, like αSMA (alpha smooth muscle actin). The activation of these cells promoted in particular conditions triggers the passage from a quiescent differentiated phenotype to an actively proliferating and synthetizing one (similar to osteoblasts’ phenotype), through the down-regulation of the expression of smooth muscle cells markers. The major role in promoting differentiation of VSMC has to be ascribed to P, whereas Ca is considered to be more relevant in the induction of VSMCs apoptosis and vesicle release. When both Ca and P reach elevated hematic concentrations, the effect of vascular calcification in CKD is synergistic. • PTH and FGF 23 (fibroblast growth factor 23, secreted by osteocytes) promote renal excretion of P by inducing the internalization and inactivation of the specific transporter in the proximal tubule. Moreover FGF23 is able to inactivate 1α hydroxylase, the enzyme that catalyzes the formation of the active form of vitamin D3 (1,25-OHvitamin D3) from its precursor 25-OHvitamin D3. This results in a decreased vitamin D-mediated intestinal reabsorption of P. It requires klotho for its activity, since it binds to its receptor with low affinity. The expression of FGF 23 increases with the progression of CKD in order to maintain serum P levels within the normal range. This is why P concentration does not become noticeably elevated until glomerular filtration falls to very low rates. Several recent studies have underlined a positive correlation between the level of FGF 23 and the incidence of cardiovascular events in patients undergoing dialysis. • Klotho, originally identified as an anti-aging protein, is a single pass trans-membrane protein that functions as a co-receptor for FGF 23. In CKD the expression of klotho that is regarded as a very sensitive biomarker of impaired renal function is deficient; the consequences are hyperphosphatemia and ectopic calcification, since one of its key role is the promotion of P renal excretion through the interaction with FGF23. Recent studies give evidence about a direct effect of klotho on blood vessels: in fact it has been observed that down-regulation of klotho in experimental models determines an increased expression of Na/P co-transporters and osteogenic transcription factors in VSMCs. This suggest that klotho could drive vascular calcification even in the absence of FGF23, by modulating Na/P co-transporter (Klotho and kidney disease, 2010). • 1,25-OH vitamin D3 promotes P intestinal absorption by increasing the expression of Na/P co-transporter. Under normal conditions these factors contribute to maintain serum P level in the normal range of 2,8-4,5 mg/dl. In early CKD the effect of renal insufficiency which is characterized by impaired P excretion and decreased expression of klotho are well compensated through the up-regulation of PTH and FGF23. Nevertheless these mechanisms reveal to be unsuccessful with the progression of the disease: in fact in advanced CDK poor P urinary excretion combined with continued ingestion of P results in hyperphosphatemia. Furthermore CKD patients are at particular risk of 1,25-OHvitamin D3 deficiency. The level of the active form of vitamin D3 depends on the activity of the enzyme 1α hydroxylase which is decreased because of the reduction in the functional nephron mass. Therefore it is necessary to modulate Vitamin D3 signaling through the use of its analogues in order to counteract the effects of its deficiency (The emerging role of phosphate in vascular calcification, 2009). Mortality in end stage renal disease is strongly correlated with P serum level higher than 5,5 mg/dl; nonetheless it is important to consider that even relatively small elevations of P from the normal range of concentration have been reported to be associated with an increased risk of mortality for cardiovascular events and other causes in both CKD patients and general population with normal renal function. Thus P load, even in the absence of severe hyperphosphatemia, may be an important driving force of vascular calcification. How P induces vascular calcification? The primary mechanism that lets P enter VSMCs is the expression of Na/P co-transporter that allows the uptake of P following a 2:1 Na to H2PO4- ratio. There are 3 major families of these transport proteins that are characterized by different structures, biochemical features and tissue expression. Type III Na/P co-transporter which includes PiT1 and PiT2 is the prevalent one in VSMCs. RT-PCR has shown that PiT1 is the predominant transport protein in humans and it is critical for the P-induced phenotypical differentiation and matrix mineralization in VSMCs. Treatment of VSMCs with a competitive inhibitor of Na/P co-transporter, the phosphonoformic acid (PFA), causes a dose-dependent inhibition of P uptake, calcification and phenotypical differentiation. These results suggest that P uptake is necessary for mineralization as well as osteo-chondrogenic transition in human VSMCs. Moreover there is enough evidence to sustain the hypothesis that these transporters may allow VSMCs to sense any change in extracellular P concentration. In fact their expression has also been observed in the parathyroid glands where they may function as sensors of extracellular P level and influence the secretion of PTH. P-induced vascular calcification is the expression of the VSMCs transition from a contractile to an osteo-chondrogenic phenotype that follows the uptake of P. The exposure of cultured VSMCs to elevated level of P induces down-regulation of genes that smooth muscle cells usually express. Among these genes there is SMA (smooth muscle actin); human aortic smooth muscle cells show increased methylation of SMA promoters when they are incubated in the presence of high level of P.
• Runx2, an important transcription factor which induces the expression of the main calcified matrix components: type I collagen, osteocalcin, and osteoprotegerin. It is believed that induction of Runx2 occurs through the activation of Erk1/Erk2 signaling. •Alkaline Phosphatase, an enzyme which inactivates the mineralization inhibitors PPi and P-OPN and allows liberation of free Pi that promotes calcification. • Osteoprotegerin, the soluble ligand of RANK (receptor activator of NF-kB) that is expressed on the precursors of osteoclasts. OPN is an inhibitor of osteoclasts differentiation that acts by sequestering RANK-L, a receptor that belongs to the family of TNF (tumor necrosis factor) and is expressed on the osteoblasts. In this way OPN prevents the interaction between RANK and RANK-L that is necessary for the maturation of macrophagic cells into osteoclasts; therefore calcification process is increased due to the inhibition of Ca reabsorption. • Bone Morphogenetic Protein (BMP), a powerful osteogenic differentiation factor that is able to induce ectopic calcification in vitro. It has been noticed that reactive oxygen species (ROS) produced in response to high P loads are involved in the osteogenic conversion of VSMCs during vascular calcification. H2O2, one of the most long-lasting oxidant agents, seems to be able to increase the expression and the activity of Runx2, supporting the progression of vascular calcification. In addition to this change of phenotype, matrix vesicles containing apatite and calcifying collagen fibrils are released from VSMCs and contribute to the development of early nucleation sites. Another mechanism whereby elevated P concentration may promote vascular calcification is the stimulation of VSMCs apoptosis which is obtained by the down-regulation of Gas6 ( growth arrest-specific gene 6). It has been reported that in human aortic VSMCs calcification the expression of both Gas 6 and its receptor Axl is reduced. The axis Gas 6 /Axl usually has an anti-apoptotic meaning, through the Bcl2/PI3K/PKB-Akt pathway. Therefore the inhibition of this axis leads to activation of caspase 3 and apoptosis. Evidence supporting the role of apoptosis in vascular calcification in vivo includes the presence of smooth muscle cells apoptosis in calcified vessels from dialysis patients. Lastly the accumulation of linear mineral deposits along the internal elastic lamina that is interposed between the intimal connective tissue and the tunica media of arteries plays a fundamental role. VSMCs are surrounded by a complex structured extracellular matrix made of collagen fibrils, elastin, fibronectin, heparan sulfate and proteoglycans. It is known that elastin degradation which is mediated by metalloproteinases increases the affinity of this matrix for Ca and promotes growth of hydroxyapatite crystals along the elastic lamina. Furthermore elastin fragments are also able to bind to specific receptors that are located on VSMCs surface and induce the up-regulation of Runx2 through the TGFβ pathway, resulting in osteogenic differentiation. It is interesting to notice that elastin degradation in the absence of high P loads is not sufficient to drive vascular calcification in vivo (The role of phosphorus in the development and progression of vascular calcification, 2011). The main factors that control the serum concentration of Ca are PTH, 1,25-OH vitamin D3 and calcitonin. The active form of vitamin D3 determines an increased Ca serum concentration by promoting intestinal absorption and bone reabsorption and decreasing renal excretion. PTH has similar effects on the kidney and the bone; furthermore it promotes 1 α hydroxylase activity, thereby increasing the production of active vitamin D3. By contrast calcitonin decreases osteoclast-mediated bone reabsorption, leading to a reduction in Ca plasma level. Through these complex mechanisms, Ca levels are kept in the normal range of 9-10,5 mg/dl. Renal insufficiency in CKD leads to vitamin D3 deficiency due to the decreased activity of 1 α hydroxylase (this enzyme is also directly inhibited by FGF23 whose serum levels are usually elevated in this kind of disease). Low level of vitamin D3 means hypocalcemia that provides a powerful stimulus for PTH secretion, in association with hyperphosphatemia. This is the cause of the secondary hyperparathyroidism that can be frequently observed in CKD. Hyperparathyroidism is usually treated with activated vitamin D receptor agonists (VDRAs). VDRAs stimulate Ca uptake in the gut, determining transient hypercalcemic episodes that are involved in the pathogenesis of vascular calcification. Furthermore, Ca-containing P binders that are commonly used to treat hyperphosphatemia induce an increased Ca burden in these patients. It should be noticed that elevated serum level is not the only reason of harmful exposure to high Ca concentration for VSMCs: in fact Ca is also released in the extracellular environment when apoptotic or necrotic cell death occurs. Of course this circumstance leads to very high local concentrations of Ca (up to 30 mM!). All these mechanism contribute to dysregulated P and Ca metabolism especially when they are associated to disorders of bone remodelling, and promote vascular calcification in CKD. Although much of epidemiological and experimental evidence involves the role of elevated serum P level as the main trigger of calcification in CKD, even high level of serum Ca and an elevated Ca x P product may be relevant in the progression of the disease. Sporadic hypercalcemia is quite common in patients who undergo dialysis because of dialysate composition and vitamin D3 and Ca-containing P binders therapies. These episodic spikes of Ca hematic concentration are often undervalued, even if they can be extremely harmful when they are associated with hyperphosphatemia. How Ca induces vascular calcification? The mechanisms involved in Ca-induced vascular calcification are similar to those of P-induced calcification. The main difference is related to the type of transporters and sensors that let VSMCs detect even small variations of Ca extracellular concentration. Differentiated VSMCs express high voltage-activated L-type Ca channels that mediate the uptake of Ca. The expression of these channel is down-regulated when VSMCs undergo phenotypical transition; at the same time the expression of low voltage-activated T-type channels is increased. Activate VSMCs presents even high expression of Ca sensing receptors (CaR) that are able to monitor changes in extracellular Ca concentration in the mmol/l range. CaRs are G protein-coupled receptors that have been identified for the first time in parathyroid glands where they contribute to the regulation of Ca homeostasis by suppressing PTH secretion. In VSMCs CaRs modulate proliferation and survival through the activation of Erk1/Erk2 pathway. Their expression is down-regulated when vascular calcification takes place(Arterial calcification in chronic kidney disease: key role for calcium and phosphate, 2011). All these proteins are involved in signaling pathways that lead to the production of inhibitors of ectopic mineralization under physiological conditions; their role is critical in the feedback response of VSMC to raised extracellular Ca concentration. The phenotypical transition involves even the large intracellular Ca stores (lysosomes, endoplasmatic reticulum and mitochondria) which play a fundamental role in cells that show contractile properties like VSMCs. 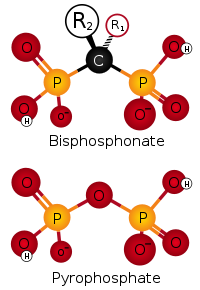 The release of Ca from these structures contribute to the development of calcification. In fact the phagocytic uptake of nanocrystals that are deposited in the extracellular matrix surrounding VSMCs induces an intracellular Ca burst that results in necrotic/apoptotic cell death (and further release of Ca). Even the endopasmatic reticulum can contribute to the release of Ca in stressful conditions. Many of its stress markers, like Grp78, are associated to activation of caspases and increased VSMCs apoptosis. However the major effect that Ca directly exerts on VSMCs involves changes in the intrinsic properties of matrix vesicles, the content of phospholipids and the activation of metalloproteinases. Moreover high intracellular level of Ca (due to the uptake from the extracellular milieu) promotes the activation of annexins, a group of proteins that are able to bind Ca and form nucleation complexes for crystalline hydroxyapatite (Chronic mineral dysregulation promotes vascular smooth muscle cell adaptation and extracellular matrix classification, 2010). Since dysregulated Ca and P homeostasis plays an important role in VSMCs calcification, the maintenance of their level in the normal range in CKD patients is the main therapeutic achievement that should be performed in order to minimize vascular damage. Reactive oxygen species (ROS) play a critical role in the pathogenesis of most forms of arterial calcification, including those that are typically detected in CKD patients and worsen with progressive loss of renal function (Oxidation, inflammation, and aortic valve calcification peroxide paves an osteogenic path,2008). It is interesting to notice that endogenous antioxidant enzymes that are essential in preventing oxidative stress are impaired in CKD. Plasma and erythrocyte levels of glutathione peroxidase, superoxide dismutase and catalase were shown to be significantly lower in pre-dialysis patients with ESRD compared to healthy control subjects. Endogenous antioxidants have also been shown to be lower in earlier stages of CKD. Therefore the increased production of ROS is accompanied by the impairment of the defensive structures that are usually in charge of removing them. Which are the main mechanism behind the ROS-mediated endothelial dysfunction that is usually reported in the pathological process of vascular calcification? 1) eNOS uncoupling: eNOS is an isoform of the enzyme NO synthase which is constitutively expressed in endothelial cells. It produces NO that is a powerful vasodilator from the amino acidic substrate L-arginine. Once synthetized, NO diffuses through the basal membrane of the endothelial cells into the smooth muscle layer where it activates the conversion of GTP to cyclic GMP performed by soluble guanylyl cyclase, leading to smooth muscle relaxation and vasodilation. This signaling pathway occurs in response to mechanical shear stress or the binding of bradykinin or acetylcholine to their receptors on endothelial cells and is vital for proper control and maintenance of blood pressure. Activation of eNOS requires the binding of the cofactor tetrahydrobiopterin (BH4). Its oxidation in the presence of a huge production of ROS leads to eNOS uncopling; once uncoupled, eNOS itself becomes a source of superoxide contributing to further oxidative damage . This circumstance may be prevented through the supplementation with BH4 in patients with CKD. 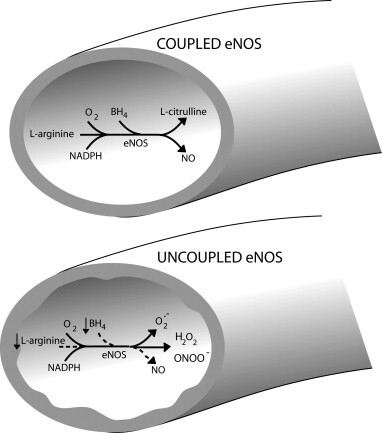 It is important to notice that the powerful radical superoxide which is produced from NADPH oxidases (one of the mayor contributor to oxidative stress in the endothelium) can combine with NO to form reactive nitrogen species such as peroxynitrite (ONOO−) that are responsible for endothelial cellular damage. Furthermore peroxinitrite formation reduces the bioavailability of NO triggering a strong vasoconstriction that leads to arteriolar obliteration that is commonly observed in calcific uremic arteriolopathy. 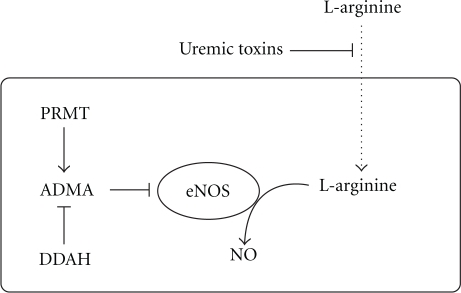 2) L-arginine deficiency: nitric oxide synthesis relies on the amino acid substrate L-arginine. L-arginine synthesis primarily occurs in the proximal tubules of the renal cortex and is impaired with loss of functional renal mass. Despite reduced production, the plasma concentration of L-arginine in patients with CKD appears to be maintained at normal levels . The maintenance of plasma L-arginine levels in CKD may be a consequence of increased amino acid release into the blood due to the impairment of L-arginine transport that occurs in the presence of increased uremic toxins. This impairment may potentially explain why L-arginine treatment has been ineffective in later stages of CKD. Endothelial cells in uremic plasma have a reduced ability to transport L-arginine because of the elevated level of urea. The transport of L-arginine occurs through the cationic amino acid transporter CAT-1. Urea transport occurs through urea transporters (UT) that is thought to be co-localized with CAT-1 in endothelial cells. Therefore the movement of urea into the cell is associated to the inhibition of L-arginine transport. This mechanism may occur with the accumulation of uremic toxins as seen in CKD and lead to reduced availability of substrate for NO synthesis. 3) Formation of ADMA and L-NMMA: another potential contributor to endothelial dysfunction in CKD is the formation of two endogenous eNOS inhibitors, asymmetric dimethyl-arginine (ADMA) and N-monomethyl-L-arginine (L-NMMA). ADMA and L-NMMA are the result of post-transcriptional methylation of L-arginine residues promoted by the protein arginine-methyltransferase (PRMT). ADMA production is about 10 fold that of L-NMMA and is elevated in patients with chronic renal failure. Its plasma levels predict progression to ESRD in patients with CKD and ultimately adverse cardiovascular events in patients with mild to moderate CKD . ADMA has been classified as “uremic toxin” and exhibits adverse cardiovascular effects. In healthy subjects infused with ADMA, heart rate and cardiac output have been shown to be reduced while mean arterial pressure has been demonstrated to be increased. The reduction in the ratio of L-arginine to methylated arginines is responsible for the inhibition of NO production in vivo. This is why interventions designed to lower ADMA production or increase ADMA clearance may be effective at improving endothelial function in CKD. Furthermore it has been observed that clearance of ADMA in the urine is impaired with renal damage and contributes to elevated plasma concentrations; however, this is not the primary reason for elevated ADMA in CKD. In fact urinary clearance of ADMA did not explain elevations in plasma ADMA in an animal model of CKD. Instead increased PRMT activity and expression and reduced degradation of ADMA by dimethylarginine dimethylaminohydrolase (DDAH, the enzyme that converts ADMA to dimethyl-arginine and L-citrulline) are likely the major causes of increased ADMA in CKD (Peripheral vascular dysfunction in chronic kidney disease, 2011). A useful method for studying the role of ADMA in this disease is through the modification of DDAH enzyme expression in experimental models. In mice infected with recombinant DDAH, NO synthesis was significantly increased while plasma ADMA concentrations were reduced compared to wild-type animals. The following picture shows the most common arteriolar findings that have been reported in histological sections from patients affected by calcific uremic arteriolopathy: vascular calcification, endovascular fibrosis, intimal hyperplasia and inflammatory response. Excessive reactive oxygen species produced in the presence of uremic toxins may be the driving force in the development of this calcific obliterative arteriolopathy. Treatments performed to restore vascular redox balance may be effective at reducing cardiovascular risk in CKD (Calcific uremic arteriolopathy: pathophysiology, reactive oxygen species and therapeutic approaches, 2010). In conclusion the evidence suggests that oxidative stress , L-arginine deficiency and inhibition of NO synthesis play important roles in the pathogenesis of endothelial dysfunction in CKD. The increased uremic burden that accompanies late-stage CKD may trigger a “uremic switch” resulting in endothelial dysfunction that is less reversible due to the inability to transport L-arginine into endothelial cells. Once triggered, conventional therapies for treating endothelial dysfunction may become less effective leading to the increased prevalence of cardiovascular diseases observed in late-stage CKD. The characterization of novel mediators in the process of vascular calcification offers the possibility to develop new therapeutic approaches which may be able to inhibit the progression of the disease. Here the most promising therapies are reported. •	Bisphosphonates: they are used in the standard therapy for osteoporosis, but they have been recently reported to be also efficient in preventing the development of calcification in blood vessels if they are administered at higher doses. Of course this treatment negatively influences bone formation: this is why serious concerns about their clinical use have been raised. Moreover bisphosphonates are usually cleared by the kidney, so they accumulate in CKD patients. However recent studies have revealed a potential use of PPi in substitution of bisphosphonates: in fact PPi has been reported to inhibit vascular calcification in uremic rats without any adverse effect on the bone. This difference in results may be explained by the fact that a specific tissue alkaline phosphatase which rapidly hydrolyzes PPi is highly expressed in the bone and is able to remove the PPi in excess. In addition to its selectivity for vascular calcification, administration of PPi is regarded as a potential therapy because it does not accumulate in renal failure. •	Alkaline Phosphatase inhibitors: these compounds have been shown to reduce VCMSs calcification in vitro by inactivating the alkaline phosphatase. Its inhibition results in increased PPi level and decreased availability of Pi. •	Vitamin K: many inhibitors of vascular calcification expressed by VSMCs are vitamin K-dependent proteins. It means that their activation requires a post-transcriptional reaction of γ-carboxylation of Glu residues to form Gla (γ-carboxyglutamate) residues. These Gla residues are responsible for the high affinity binding of Ca ions of the entire proteins. The reaction of carboxylation that occurs in peripheral vessels is mediated by the reduced form of vitamin K (the hydroquinone or quinol form). This is why a vitamin K rich diet could be useful in preventing this disease, since it is reported to be inversely related to severe arterial calcification. Among these vitamin K-dependent proteins that act as inhibitors of ectopic calcification there is the Matrix Gla Protein (MGP). MGP belongs to this group of proteins that contain a Gla domain; this is set in the middle of the portion that seems to be important for substrate recognition by the carboxylase. MGP usually prevents matrix mineralization through the inhibition of calcium and phosphate precipitation and the suppression of the activity of bone morphogenetic protein 2 (BMP-2), a powerful osteo-inductive factor. It has been reported that inactivation of MGP through the treatment with warfarin ( a vitamin K antagonist) in rats leads to rapid calcification of the arteries. 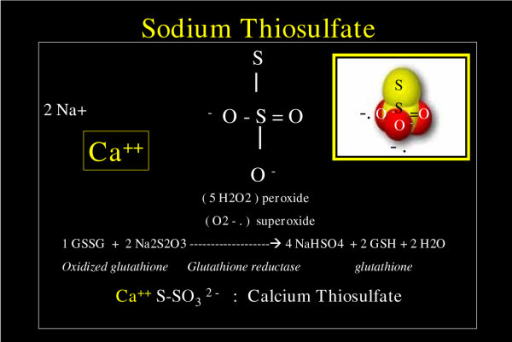 •	Sodium Thiosulphate (STS) : this powerful antioxidant has received considerable attention during the past years for the treatment of calcific uremic arteriolopathy. In fact intravenous STS administration has recently been shown to prevent vascular calcification in uremic rats. STS has two unpaired electrons that are available to be donated in order to counteract the negative electric charges associated with ROS. Furthermore STS can generate the reductive form of glutathione (GSH), an efficient antioxidant. In this way STS may allow the re-coupling of eNOS and contribute to the re-establishment of endothelial functions and the relief of sub-dermal ischemia and pain that affect dialysis patients. STS is also useful to chelate Ca that accumulates in excess along arterial walls. The therapeutic field that has been explored during the past years offers new intriguing strategies that could be adopted in order to stem the detrimental effects of ectopic calcification. This degenerative process is regarded as a significant independent risk factor for the development of adverse cardiovascular events, therefore its huge impact on human health cannot be undervalued. Thanks to several recent studies the understanding of molecular mechanisms and pathways that induce pathological calcification along arterial walls has grown exponentially. The stratification of knowledge that is still in progress is fundamental to identify new potential therapies that could prevent or reverse the endothelial dysfunction associated to widespread vascular calcification. The characterization of novel mediators will certainly be useful to provide the basis for the development of innovative approaches capable of dealing successfully with this life-threatening condition. Per quanto riguarda la questione dello shear stress, nella tesina ho fatto un accenno allo stress meccanico (dovuto all'attrito prodotto dal fluido laminare sulle pareti endoteliali) inteso non come fattore scatenante della calcificazione, ma come stimolo in grado di attivare, in condizioni normali, la eNOS. Questo si ricollega alla perdita di funzionalitÃ della eNOS che si verifica, a causa dell'aumentata produzione di ROS, nell'arteriopatia calcifica uremica. Ne consegue una forte vasocostrizione che va ad aggiungersi alla calcificazione vascolare legata a disordini sistemici del metabolismo minerale (tipici dell'insufficienza renale) nel determinare disfunzione endoteliale e ostruzione dei vasi. Nelle malattie renali croniche la calcificazione Ã¨ determinata proprio dal deterioramento della funzionalitÃ renale. Nell'insufficienza renale, infatti, la ridotta escrezione di fosfato e il deficit di calcitriolo comportano iperfosforemia e iperparatiroidismo secondario. Queste sono le principali condizioni che, tramite le vie di segnalazione illustrate nella tesina, contribuiscono allo sviluppo della calcificazione ectopica. In condizioni normali, invece, i vasi non sono calcificati perchÃ¨ la funzionalitÃ renale Ã¨ tale da garantire un corretto bilancio elettrolitico.